In case you haven’t been paying attention, the Apple iPad won’t be the only quality tablet on the market for much longer. Over the past week, companies including Archos, LG, ViewSonic, and Samsung have announced Android-based tablets. While there haven’t been any quality contenders to match the iPad’s offerings just yet, Samsung’s Galaxy Tab stands out from the pack. 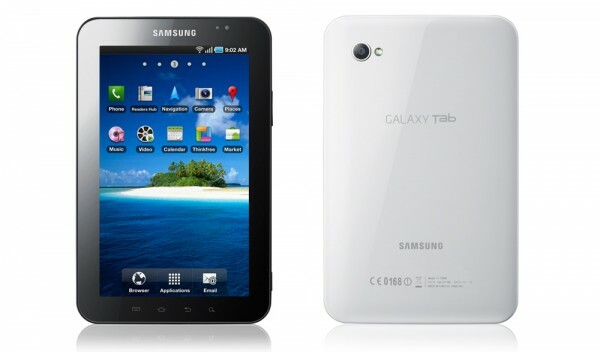 The Galaxy Tab runs Android Froyo 2.2 on a snappy 1GHz Cortex A8 processor that rivals iOS on the iPad. 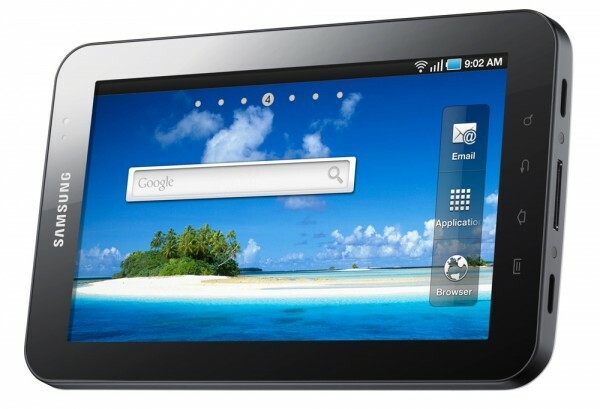 While most Android devices generally sport a 3 to 5 inch screen, the Tab sports a larger 7 inch capacitive multi-touch enabled LCD display. It is interesting that the Tab doesn’t use Samsung’s flagship Super AMOLED screen technology, which is featured on their Galaxy S phones. However, users probably won’t be complaining since the WSVGA 1024-by-600 pixel resolution offers a higher pixel density than the Apple iPad. Although Android isn’t natively optimized for a tablet in terms of technical capabilities, interface design, or intuitiveness, Samsung’s TouchWiz customizations fills the gaps. Handling the device with a single hand should be easy since the Tab is only 7.5 inches tall, 4.7 inches wide, and a half-inch thick. It also weighs just .84 pounds, making it nearly half as light as the 1.6 pound iPad 3G. While specifics on an U.S. model aren’t available yet, we do know that the Samsung Tab supports 3G connectivity meaning there’s good chance of seeing a cellular carrier branded and subsidized model. Fortunately, for those that don’t want to deal with contracts, Samsung will also ship a WiFi-only model (802.11 a/b/g/n supported). In addition to a 3.5 mm jack, the Tab also has Bluetooth 3.0 for use with wireless speakers, headsets, and stereo headphones. Google Maps with Navigation comes preloaded and will take advantage of the integrated A-GPS module. Samsung also offers a windshield/dashboard mount for use as an in-car navigation and entertainment device. While many Apple fans are eagerly awaiting an iPad refresh that supports a front-facing camera for FaceTime calls, the Samsung Tab already supports that feature. A pre-installed service will let customers take advantage of the 1.3 megapixel front-facing camera to place video calls over 3G or WiFi networks. There is even a 3 megapixel camera with auto-focus and a LED flash on the back for capturing images and recording 720p video. The interface will even let customers edit and upload media to social networking services. While Android 2.2 is fairly lacking when it comes to handling multimedia, the Samsung Tab includes some TouchWiz enhancements to solve that problem. A Music Hub offers a powerful interface for browsing through large libraries of content and the Media Hub brings on-demand movie rentals and purchases directly to the tablet. There’s even support for 1080p video playback with DivX certification (XviD works too). For audio enthusiasts, the Tab can play lossless audio codecs such as FLAC. According to the official documentation, the 4,000 mAh battery will provide nearly 7 hours of video playback. The Samsung Tab comes in 16GB and 32GB capacities, but there’s also support for MicroSD expansion (32GB card max). While the iPad touts a robust HTML5 browser, it controversially lacks Adobe Flash 10.1. 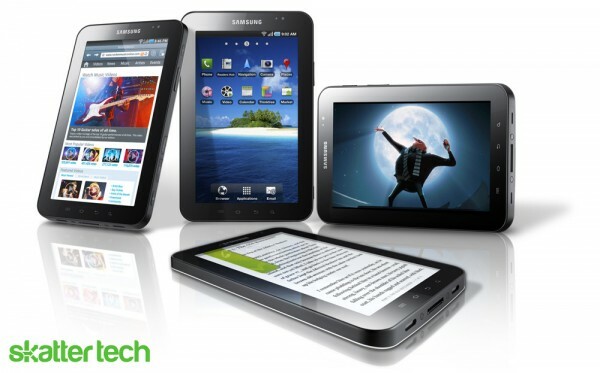 With Android 2.2, the Samsung Tab works with Flash-based sites, videos, and content right out of the box. The multi-touch browser even includes an RSS reader built-in. For those that enjoy reading, Samsung offers access to Newspapers, Books, and Magazines through partners such as Kobo and Zinio. And social networking addicts can interact with a news streams from a single streamlined interface. A Samsung App Store will even provide additional Tab-optimized applications to complement the thousands of apps from the Android Marketplace. While the Apple offers document, spreadsheet, and presentation editing programs with Pages, Numbers, and Keynote, these iWorks apps cost extra. While probably not nearly as fancy or innovative, Samsung includes ThinkFree Office with the Tab. To make typing easier and faster, the Swype keyboard comes pre-loaded. For those that prefer a tactile experience, Samsung will offer a keyboard dock accessory as well. I should note that Android should also be compatible with most Bluetooth keyboards. There’s also mention of a capacitive stylus, but I don’t know if anyone would consider using it. When I reviewed the Apple iPad earlier this year, I was very critical. While sales figures indicate success, I still stand by what was my biggest concern: the iPad was too expensive and it did too little. With the recent announcement of iOS 4.2 that brings multitasking and other features, the iPad now has a lot more to offer. Let’s not forget that many developers have also embraced the platform brining plenty of quality applications. When it comes to the Samsung Galaxy Tab, I already see some major issues. If the Tab is more expensive than the iPad, people aren’t going to consider it even if it is a better product. The iPad has become a part of social culture and even gets mentions on TV Shows and News Stations. While Google is still working hard to solve user experience issues on Android phones, tablets will be a whole new issue. Aside from Samsung’s pre-loaded apps, most Android Marketplace downloads probably won’t work so well on a high resolution display. But let’s keep in mind that the Galaxy Tab already offers a fast operating system with support for multitasking, cameras for video chat, and a browser that supports flash content giving it a good head start. However, it will be hard to tell whether this will sell until it hits the market. Skatter Tech will be getting our hands on a review unit as soon as we can, so stay tuned for our thoughts and a full review.